As it is essential to check for the efficiency, long term durability and affordability of a water heater, it is also necessary to put into consideration the size of the water heater. This is because a water heater becomes useless if it does not serve adequately for people who have gotten it. So, before you go for a what heater you must consider the size of your family, place of work or any commercial usage. This article has been written with five significant sizes with recommendations of the number of people or location to install it. 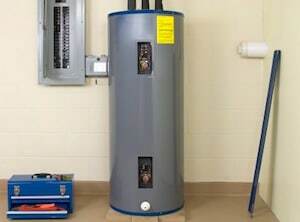 The type of size of your water heater is based on the forms of the tank. The size you will be considering for a hot water tank is different from what you will need in a tankless water heater. For this model of hot water heater, their sizes are based on BTU input and capacity in gallons. This model has been existence for a long period of time and is the most common and popular water heater form. It stores water for an extended period for easy access whenever you need hot water. There are two essential things to put into consideration when you are in search of a water heater size suitable for your home or place of work. These are the First Hour Rate (FHR) and Peak Hour Demand. This deals with the amount of hot water a water heater can produce for a family in 1 hour. This deals with the amount of hot water a particular family consumes in your period. The storage water heater has various sizes according to the space and the number of users. 1. 85-100 gallons of water. This is the largest storage water heater tank in the market today. It is the best option for an extended family with a member of 5 people or more. This size gives these people an opportunity to take a bath each daily, use hot water for kitchen need and at the same time use laundry one in a week each. Size is so unique that it satisfies each and everyone’s need with leaving anyone out. Also, it is vital that this size tends to take a lot of space compared to tankless and other mini-tank water heaters. Likewise, it is sometimes expensive to purchase. This is the runner-up in water heater large size. It is the suitable size for a nuclear family with at the highest four members or a couple two just two children. It gives them the opportunity to take a shower each daily. Alongside with this, this family can use laundry for at least twice in a week with other kitchen usages. It is slightly expensive and takes less space as compared to 100 gallons of water. This is the best and most suitable water heater size for couples or three people at most. Each of these people can take a shower or bath daily. They could also do laundry for like two to three times a day without failing to provide an adequate water supply for the kitchen use. This water size comes at a slight affordable price. This is the smallest size of all storage or tank water heaters in the market today. It is a suitable size for a single person or couple who love to keep water. A bath or shower can be taken twice daily from this tank, and it will still be able to carry out other function such as laundry and kitchen use. Also, it comes in a compact size that makes it for into any space. Also, this size comes in a cheap price. This is the new model of water heater that is emerging in the world today. It comes in a compact and a sleek design that does not only make the water heater portable but also adds elegance to the place of installation. Also, this model does not run out of the water, and at the same time, it is water efficient. It uses either a gas or electric energy to supply adequate hot water for either a home or commercial places. With this product not having a tank, it means that you do not need to consider the capacity to determine the size, instead you need to consider flow rate and temperature rise. This deals with the gallons of hot water a user can use per minute from a tankless water heater. It deals with the level or degree temperature a heater uses to pressurize or heat hot water. This is also one of the largest tankless water heaters. It is the most suitable for laundry and dishwashing. With this size, you can use a laundry for up to two times a week and wash your dishes daily. This is an average tankless water heater. It is the most suitable for hair washing, face washing, food preparation, and hand washing. Size gives you to have a single shower or bath daily and also provides adequate hot water for kitchen use and laundry. This is the smallest tankless water heater. It comes with a small price tag that can be affordable by all users who are either on a budget or earn a low income. It is suitable for shaving. Having a hot water heater that gives you the chance of getting a warm bath or enjoying a hot coffee or getting a warm massage and other necessary things it is used for is a great choice that every home wants to make. The problem now is that the hot water heater is produced by different brands with unique features. It is sometimes difficult to differentiate one brand from the other. This is because these various brands have many things in common. But the article is set to give you details about five major hot water heater brands and their products so you would have to make a good choice when going for one. When it comes to selecting a brand that is not only popular but has produced significant numbers of water heater products in the industry, this brand would always be a talking point. Having begun its production of water heated in 1925, it was able to produce its first automatic gas storage water heater in 1931. Even though this brand has been in existence for a long period, it provides products that suit the modern taste. 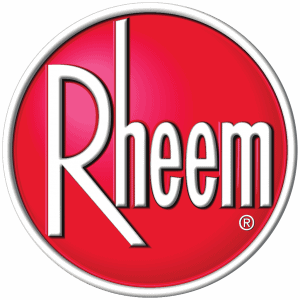 According to customers reviews, Rheem is known to be the brand that produces the highest number of water hearts in North America. Also, this brand is known for its production of both natural gas and electricity model of hot water more celebrated. Likewise, it is known for the production of hot water tanks and tankless water heaters design. For Rheem tankless water heaters, they have a compact design and are also affordable. Rheem 240V Heating Chamber RTEX-13 Residential Tankless Water Heater and Rheem RTG-95XLN 9.5 GPM Low NOx Outdoor Tankless Natural Gas Water Heater are the fastest selling Rheem tankless water heaters. While the tank model of this brand comes in a large size that can take up to 30-50 gallons of water. Rheem RTEX-AB Water Heater Booster and Rheem 40 gal. Residential Gas Water Heater, NG, 38000 BTUs are the best selling tank storage Rheem water heater. When considering the electric and gas forms of this brand, it is essential to take note of something. For the gas model, it comes with the tank size of 30-80 gallons of water. Alongside this, it is an eco-friendly water heater that only consumes a little amount of energy to pressurized water. Rheem Performance Platinum XR90 29 gal. Tall 12 Year 60,000 BTU Natural Gas Water Heater is one of the best natural gas water heaters in the market. Also, the electric model of this brand is durable and has lightweight designs — Rheem Performance Platinum XR90 29 gal. Tall 12 Year 60,000 BTU Natural Gas Water Heater is one of the best ranking electric Rheem water heaters. Out of all the features that this hot water brand possess, reliability and efficiency are its unique features. If you are in search of a water heater that does not fade not need regular repair and maintenance, then this brand is an excellent choice for you. This brand’s products are not only limited to home use alone, but they are also efficient hot water supply for commercial use. Also, it is a brand with long term durability. Bosch brand gives at least a 15-year warranty on its water heater used by a nuclear family. For a family with a large population, it provides an 8-year warranty and gives a 5-year warranty for commercial usage. Its water heaters are known to be slightly expensive as gas tankless water heater cost up to $3000. 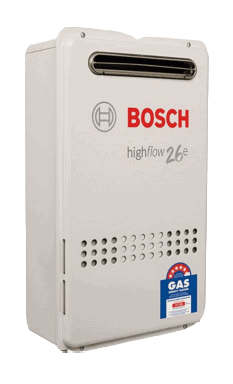 Bosch is a great brand which produces tank storage water heater and tackles water heater. Apart from this, both the tan and the tankless water heater comes in either a gas or electric model. While the tankless model of this brand has easy installation procedures and the tank model comes in a large tank that can take 30-60 gallons of water. Bosch Electric Mini-Tank Water Heater Tronic 3000 T 4-Gallon (ES4) – Eliminate Time for Hot Water – Shelf, Wall or Floor Mounted is the best Bosch electric tank water heater. Bosch 940 ES NG Tankless Water Heater, Natural Gas is Bosch popular and efficient tankless gas water heater. For a water tank that can last a large family for an extended period, this brand is no doubt the best. Rinnai is best known for its production of outstanding tankless water heaters. Even though it also produces a traditional water heater and has been existence since 100 years ago, this brand tankless products are the best in the market. Notwithstanding, his brand offers an adequate supply of pressurized water for commercial and home use. The major downside that this product is known for is that it does not come at a low price; instead, its price is slightly pricey. Also, it offers a 6-year warranty and leak-free for home usage of its product including heat exchanger and other storage tank parts. Likewise, it gives a 5-year warranty on its products including a heat exchanger and other parts of the storage tank for commercial usage. Rinnai tankless water heaters come in two primary forms namely ultra series and luxury or value series. While the ultra series features five sizes ranging from 130, 000-190, 000 BTU, the value or luxury series features three sizes ranging from 120, 000-180,000 BTU. Apart from these two primary forms of Rinnai tankless water heater, it also has a hybrid tank-tankless water heater. For this form, it combines a tankless model with 40 gallons of the storage tank to give efficient hot water heater. The ultra series comes with a venting option that enhances easy installation processes. With its recirculation solution, this brand pressurizes water at a fast rate compared to all other brands. Another unique feature that makes this brand outstanding is that most of its tankless water heater model comes in a compact design that makes it fit perfectly where large tank water heater might not fit. Rinnai RUC98iN Ultra Series Natural Gas Tankless Water Heater, Twin Pipe is the most popular Rinnai tankless water heater. No need for a debate if you are looking for an efficient tankless water heater, this brand is the best option. EcoSmart is a brand that offers you the opportunity to save up a large amount of money on the energy bill. It is an eco-friendly product that consumes a little amount of energy both for its gas and electric water heater. Meanwhile, it is an high-efficiency water heater that does not only add elegance to your commercial workplace and your home alone but provides adequate hot water needed for refreshment and relaxation. Also, EcoSmart products are less expensive can be purchased by people on a budget or middle and lower class citizens. The nature of its price does not stain its performances as it supplies hot water at a sufficient rate. Furthermore, another outstanding feature about this brand is that it has a long term warranty on both the exchanger heat and storage tank parts. It offers a 5-years warranty on the heat exchanger and storage tank part for both home and commercial use. EcoSmart produces unique tankless water heaters that save a lot of space at anywhere of installation. They can also be moved from one place to another as they come in a lightweight design. More importantly, this tankless model comes in either a gas or electric form. 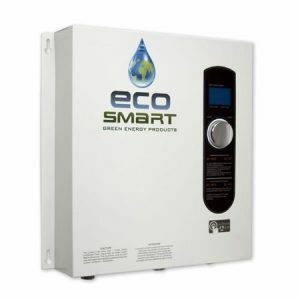 EcoSmart ECO 27 Electric Tankless Water Heater, 27 KW at 240 Volts, 112.5 Amps with Patented Self Modulating Technology serves as the best selling electric tankless water heater. Ecosmart is the brand that offers less cost, less energy bill, less energy consumption rate, and limited lifetime warranty. 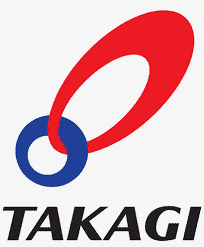 Tagaki brand is regarded as the most efficient tankless water heater in the market. It is a Japanese brand that has been in existence since around 1950s. It is a brand that combines traditional features with modern qualities to give efficiency water heater. Also, it is the first brand which is known to have improved thermal efficiency of up to 95%. At the same time, it is regarded as the most innovative brand with several advanced technologies used in the production of the water heater which includes Air Fuel Ratio Sensor, freezing protection, Hi-limit switch and overheat cutoff fuse. Tagaki products most times come at a low price for affordability and comfort of the users. Its price ranges from $300-$5000. Tagaki is a brand that has long term durability. It offers a 15-year warranty on the heat exchanger for family use and gives a 5-year warranty on the other storage part of the products. It produces both tank and tankless water heaters with either a gas or electric energy source. It tankless water heater comes in two primary forms which are condensing and non-condensing forms. While the non-condensing model features a standard-type heat exchanger and a stainless steel venting, the condensing model features high energy factor and ultra-low Nox. Takagi T-KJr2-IN-NG Indoor Tankless Water Heater, Natural Gas is the fastest selling and most popular Tagaki water heater. You can get your pressurized hot water from either a tank or tankless water heater. There have always been a lot of debates about which water heater is the best between the two. Although both water heaters possesses great qualities that differentiate them from each other, the truth of the matter is that both of them are better and none of them has excessive qualities more than the other. A tank hot water heater is an old model which has in the market for a long period. For a tankless model, it is a new product emerging and having great significance in the market today. As a result of this, it has become a task for us to look into the benefits and downside of having a tank or tankless hot water heater. 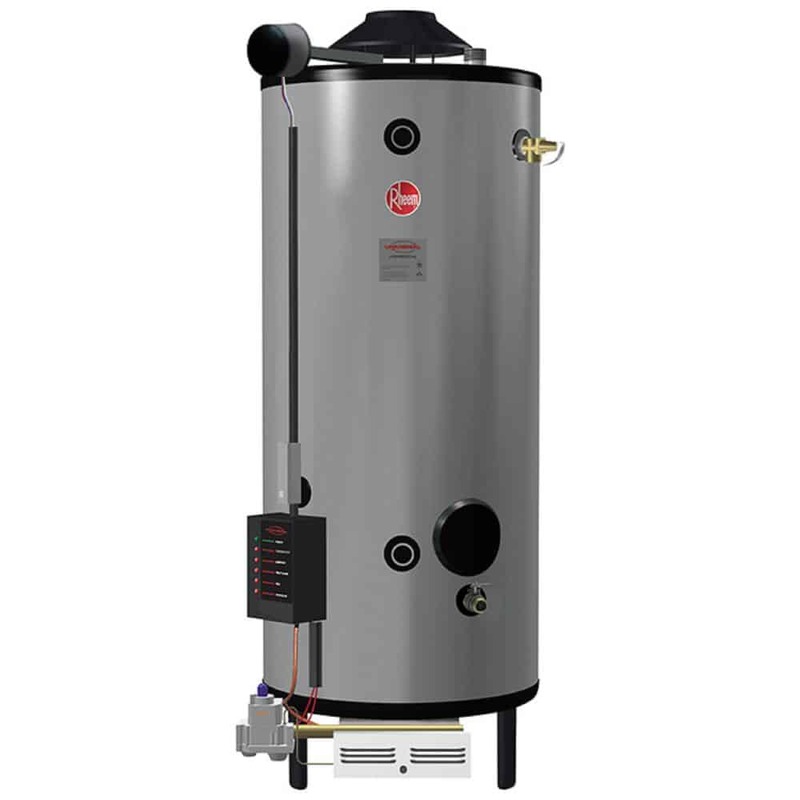 Tank hot water heater is also known as the traditional hot water heater tank or storage tank water heater. This model comes with a reservoir or tank that can store 30-50 gallons of hot water. It uses either natural gas or electricity as its source of energy. Although natural gas used for heating tank water consumes less energy, it is more expensive than energy from electricity. Water from the tank is distributed by a pipe coming from the top of the tank to their places of need such as kitchen, bathrooms, etc. Examples of this product include Bosch Electric Mini-Tank Water Heater. Most storage hot water tank comes in a slightly low price that makes it affordable for people in either the lower class or upper class. Also, it is the best choice for people who are on budget planning to spend less on water better. Most of these models come within the price range of $300-$700 which is against the price of a tankless water heater that has the price range of $2000 and above. These products do not come with a high level of technology or complicated features like the tankless water heater. With its heating elements and other minor body materials, you can clean it easily without much stress. This model is known to be efficient has it provides hot water any time of demand. It is an ideal hot water heater for a family with a large population. Either using natural gas or electricity, this model consumes a lot of energy. Since this product reheat itself either when used or not, it tends to waste a lot of energy. In the USA, this product heating water accounts for not less than 20% domestic energy. Since this model is a traditional hot water heater, it comes in a big size. This size makes it less portable and also does not gives it a compact design. For its installation, it requires a large space for perfect fitting. Users might find it a little bit difficult to put this product into action because of its complicated installation procedures. Most times, this model installation cost some out of money while replacing one with another. One of the major downsides of this water heater is that it can run out of water anytime. Alongside this, this model does not cater for simultaneous bathing as another user have to wait for about 2 hours for the water in the tank to reheat. For this product, it only performs for a short period. Even it’s designed begins to discolor a fade easily. That is why companies that produce this model gives it a limited lifetime warranty. This is also known as on-demand or instantaneous water heater. It is a new model that is emerging in the industry today. It also uses either natural gas or electricity as its source of energy. Examples of this model include Rinnai RUC98iN Series Natural Gas Tankless Water Heater. This product comes in a small size and portable design that helps it fits perfectly into any space. Apart from this, it is also a lightweight model that can be moved from one place to another with ease. This product produces adequate hot water needed at any time without consuming a large amount of energy. You can get within 2-3 gallons of water from it per minute. And also, it does not run out of hot water. Unlike a tank water heater, this model tends to operate for an extended period. I hardly fade or discolor easily. It can operate up to 5 years without requiring any form of repair. Having just a single part without a tank makes it not only makes installation procedures easy, but it is also cost saving. Most tankless water heater cost between the range of $2000- and above. This price tag looks costly and may not be easily afforded by lower class citizens or people on a budget. Maintaining a tankless water heater is difficult and costly. This is because it features some technological materials which require extra efforts and cost in maintaining and keeping it for an extended period of it. Many people prefer to take hot showers because they know its role in relaxing muscles and calming nerves. Therefore, they decide on having water heaters in their homes. Some upgrade to getting tankless water heaters while others stick to the traditional water heaters. Now, these two are very good in supplying you heated water for your bath, laundry or what have you but each comes with its own cost. How then do you know which to go for? 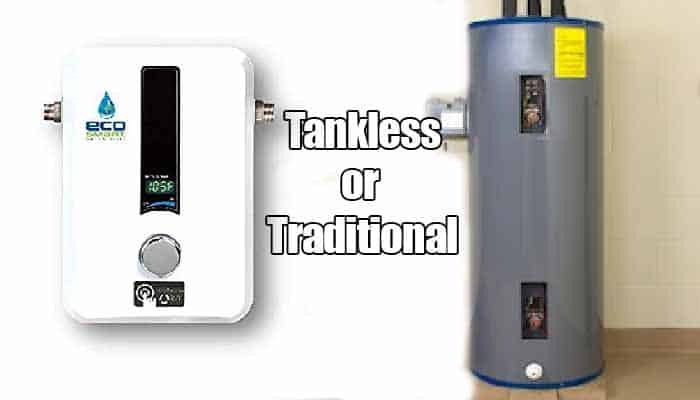 A traditional water heater or a tankless one? In making this decision on behalf of your household, factors like installation cost, space, water usage, utility bill, etc., should be considered. Let us take a look at these two types of water heaters. A conventional water heater works by preheating 30-50 gallons (depending on its gallon-capacity) of water in a tank, and when the water has been used, it immediately refills and heats another gallon again. Pocket-friendly installation cost: Traditional water heaters are very cheap to install. With half the price of a tankless water heater, you get a traditional water heater fully installed. Cheap to maintain: Traditional water heaters are inexpensive to maintain. Since they are designed with less sophistication, repairing when faulty will only cost you a penny. They occupy space: Traditional water heaters occupy space as they come with tanks in different sizes and capacities. High utility cost: The method of heating and reheating water at a pre-set temperature, regardless of when it is needed, causes a high utility cost. It even gets higher if the water heater uses electric energy. There is the possibility of running out of water: It is possible for a traditional water heater to run out water, especially if the tank is a small one. To avoid this, you might decide to go for one with a bigger tank but mind you; bigger tanks means higher energy cost. Short life span: Traditional water heaters last up to 10-15 years before replacement which is shorter when compared with a tankless water heater. This water heating system does not have a tank. It heats water directly. When the hot water tap is turned on on demand, cold water travels through a pipe into the unit, and in the process, a gas burner or an electric element heats the water. 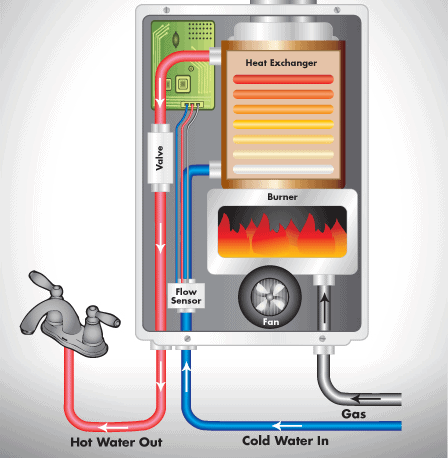 With this kind of mode of operation, tankless water heaters do supply constant hot water. Pros and Cons of a Tankless Water Heater. A constant supply of hot water: Since tankless water heaters do not have tanks that store heated water, instead they supply as you demand it, there is no way they will run out of hot water. Low utility bill: Although tankless water heaters might cause you quite a fortune to install, but in the long run, they cut down your utility bill. This is because you do not have to pay for what you do not need. Traditional water heaters store hot water at a pre-set temperature, whether you need it or not, thereby increasing utility bill but a tankless water heater only provides you with hot water when you need and demand it. In the long run, you get to save yourself some dollars every year. Takes up little space: The portability of tankless water heaters gives them a plus. Since they do not come with a tank, they are very small and can be installed anywhere- even outside on the wall. Longer life span: Compared with traditional water heaters, tankless water heaters are designed to last double the years’ traditional water heaters can last. Twenty years and above, a tankless water heater will still work as efficient as when newly bought. Water temperature is consistent: Since tankless water heaters do not have to store water and keep reheating it, but rather supply water on demand, the water temperature is constant. High installation cost: One thing that can scare you a bit about tankless water heaters, is the price. Compared with traditional water heaters, tankless water heaters are costly to install. A single installation can cost you an amount of $2,800 to $4,500, depending on the model and place of purchase. Which Is Right for My Home? Tankless Water Heater Or Traditional Water Heater? Water usage: How often do you use water in your home? If your house is one that uses a lot of water in a day- say 41 gallons and above, then a tankless water heater is the best for you. Budget: If you aim to cut down on your utility bill and save a few bucks a year, then go for a tankless water heater. Feedback from users of tankless water heaters is that they can save $100 per year. Affordability: Before going for a particular thing, you should be sure your income is solid enough to cover the cost. A tankless water heater is quite expensive and you get it for your home depends on your income. If your income can cover the cost of installation of this water heater, then go for it. In the long run, you will be able to save more money than when using a traditional water heater. Space: You do not want a house all crammed because of appliances, leaving little or no space left. High water usage can amount to you purchasing a water heater with a bigger tank, but with tankless water heater, you have your space and still use hot water to your satisfaction.